What's the latest? 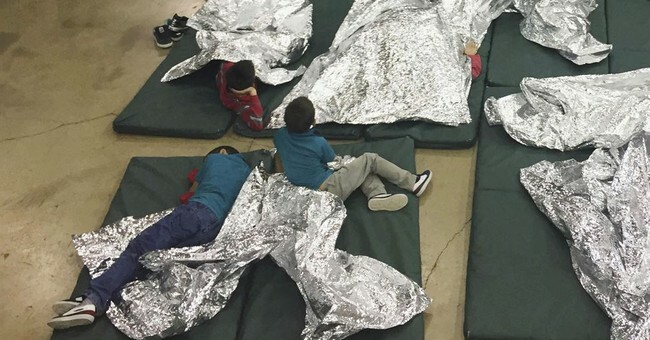 Kids in cages, separated from their moms! Oh no! That only happens to every other criminal ever. Well, every American criminal ever. Illegal alien criminals, who drag their kids through scorching deserts to break the law because their own countries are The Term That May Not Be Spoken But Trump Spoke It (which itself created a mini outrage a while ago) are, I guess, supposed to be a special kind of criminal that doesn’t get separated from his/her/xer kids upon arrest. Wait, does that sound right? Why would they be treated differently…I don’t think…STOP! But kids in cages is only the most recent iteration of the recurring phenomenon. There are hundreds of others. Building up some sort of bogus outrage with the help of the liberal media is now standard operating procedure. Derek’s book chronicles how this obnoxious strategy came into being, tracing such Fauxtrage Classics as the climate change scam from its cheesy origins as global freezing to global warming and finally global everything. The idea is to create a crisis, to which – surprise – the liberals hyping it have a solution. And it’s inevitably a solution that benefits the liberal elite. How do you deal with this ploy? How do you resist the tugging of your heartstrings or the pulling at your patriotism (“Everybody hates Russians – let’s say Trump loves the Russians. And so does the NRA!”) that they employ to make you fall into line? You get woke to the scam. Look for the indicators. Is it something that seems unreasonably horrible? Well, like something that sounds too good to be true probably is, something that sounds too bad to be true likewise is probably not true either. Does Trump ordering screaming babies to be wrenched from their innocent mommies’ arms and cast into dungeons sound pretty extreme? Yeah, because it is. And it’s a lie. Is it something where the proposed solution benefits the liberal elite? For global warming, the answer they give to this threat THAT WE MUST ACT UPON RIGHT THIS MINUTE is to give liberals more power. Same with global cooling. And same with global staying the same. Are you allowed to ask questions? If you start pointing out that maybe a good way to avoid being arrested for illegal entry and being separated from Junior is to not enter the U.S. illegally with a kid, is the response that you are a hating hater of hatred and probably a Nazi too? If they are trying to shout you down or browbeat you into silence, that’s an indicator that you’re in the midst of another Cat 5 outrage. You can’t fool all of the people all of the time, and human beings tend to tire of constant crisis-mongering. Did you notice how most people kind of shrugged about the kids in cages thing? And did you notice how the Trump administration hasn’t stopped locking up illegals and recognizing Get Out of Jail Free Kids? That’s how you deal with Outrage, Inc. You ignore it, and watch it sputter and fade away.